An Argentine City Mourns 5 Friends Killed In New York Truck Attack : The Two-Way The men were enjoying a reunion visit to New York City and had just biked through Central Park when a truck driver mowed them down Tuesday. Three other people died and 12 more were injured. Five of those killed in a truck attack in New York City were among a group of close friends from Argentina celebrating their high school graduation 30 years ago. Hernan Ferruchi, Alejandro Damian Pagnucco, Ariel Erlij (first three from left), Hernan Diego Mendoza and Diego Enrique Angelini (second and third from right) were among eight people who died in Tuesday's attack. Five of the eight people killed in a truck attack on a popular bikeway in Lower Manhattan on Tuesday were part of a group of 10 close friends who had traveled to the city to celebrate the 30th anniversary of their high school graduation. The men were from the port city of Rosario, Argentina, 185 miles up the Paraná River from Buenos Aires. They were still close, and got together several times a year for barbeques or games of volleyball. NPR's Philip Reeves traveled to Rosario, Argentina's third-largest city, and visited Instituto Politecnico Superior San Martin, the high school from which the men had graduated. He spoke with the school's vice principal, Alicia Oliva, who told him that students at the school were stunned. "We always see these types of attacks as something that happened really far away from us, and it doesn't impact us directly," she says. "And now it's come to our community." A video shows the group enjoying a bike ride on Tuesday shortly before the attack. The video was taken by Ariel Benvenuto, who survived. Viviana Bignaduzza taught the five friends in a mechanics class in the 1980s, and remembers them well. "They were always in touch with each other," she told Philip. "They knew about each other's success, each other's sadnesses. And they were always very kind to each other." The men who died were Ariel Erlij, Diego Enrique Angelini, Hernan Diego Mendoza, Alejandro Damian Pagnucco and Hernan Ferruchi. Another of their friends, Martin Ludovico Marro, lives in Boston and was injured in the attack. "We stand with the families in this terrible moment of deep pain, which is shared by all Argentines," the Argentine Foreign Ministry said in a statement. In a photo taken at the airport in Rosario, just before the men left on their trip, eight of them are captured smiling broadly, their arms around each other's shoulders. 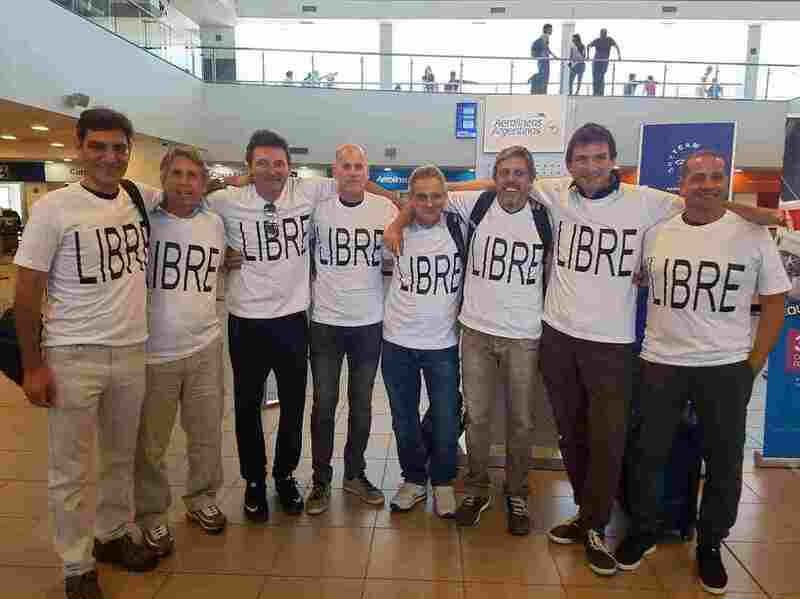 They wear matching T-shirts that say "Libre" — free from any responsibilities, explained Cecilia Piedrabuena, the wife of survivor Ariel Benvenuto. People place candles in front of the Politecnico high school in Rosario, Argentina, which five of those killed in a truck attack Tuesday had attended as teenagers. The friends had ridden bikes through Central Park and when they took their spin to Lower Manhattan. "They were pedaling in lines of two, chatting, laughing, enjoying the ride" when the truck struck them at high speed, Piedrabuena told an Argentine radio station, according to The Associated Press. In addition to the five Argentines, three other people died in the attack. One of them was Ann-Laure Decadt, a 31-year-old Belgian woman, the AP reports. She had a two small children, including a 3-month-old son. She was remembered fondly in her home village of Staden, where her family owned a feed business. "Anne Laure meant so much to us in town," Mayor Francesco Vanderjeugd, was quoted as saying by the AP. "It is an attack in New York, but also one on our community." The other two people killed were Americans, both young men who worked in Manhattan. Darren Drake was a 32-year-old project manager for Moody's Investor Services, and had served as school board president in his hometown of New Milford, N.J. His father said Darren had recently lost a lot of weight, and liked to ride a bike when he had a few minutes free during the day. "He was one of the good guys. He would give you the shirt off his back if it meant you would be OK, and you would be better for it," longtime friend John Patterson Jr. told NJ.com. "I don't ever think I saw him with a frown on his face." Nicholas Cleves, the other American who died, was a 23-year-old software developer who was living with his mother in Greenwich Village. He was a recent graduate of Skidmore College, working at his first job. Cleves was kind, intelligent and curious, his friend Bahij Chancey told ABC 7 New York. And biking was simply how he traveled his city. "He's from the Village," Chancey said. "He grew up in the Village, and like me, he grew up biking around New York to get around."